Here at Sydney MCS we specialise in the provision of aged care services for people from Culturally and Linguistically Diverse backgrounds (CALD). We recognise and value that people from CALD backgrounds have their own unique needs when it comes to in-home personal care. 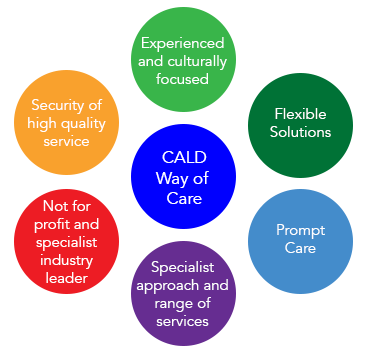 What makes us different as a provider of Aged Care Services is the “CALD way of care”. We acknowledge that every person is different depending on their family background, culture and languages spoken. CALD way of care helps to build your loved one independence. It’s all about maintaining and improving our clients health whilst in the comfort of their own home. Over 15 years of dedicated in-home care specifically targeted to your cultural and linguistic uniqueness. Because our Care Workers come from a CALD background themselves, they know exactly what is important when it comes to looking after you. We offer Government subsidised and private programs, allowing you to pick and choose as your care needs change. Our Aged Care Services include Multicultural Home Care packages, Multilingual Home Care and Centre Based Day Care giving you access to clinical nursing, personal care, domestic assistance and social support. We are committed to provide Care Workers within a reasonable time frame to ensure you are well looked after and taken care of. We focus on South East and Inner West Sydney region, but serve broader Sydney as well. We provide dedicated and passionate Care Workers with the relevant education and work experience in your language. Our services include clinical care, personal and domestic care and we pride ourselves in supporting people living with dementia. Rosa Loria founded Sydney MCS with a passion to make a difference by providing people from CALD backgrounds the opportunity to keep living at home with specialist care. We are a 100% not for profit organisation, making a difference in your community. Our delivery of care is continually monitored and improved and we are currently in the process of getting ISO certified. If you are not eligible for funding from a Home Care Package, these services can be purchased on a private basis.